His article is to the right. He has successfully taught PSRS to JROTC and struggling 11th and 12th graders. This is Mitch C. the guy that you met who is teaching in Guatemala. I.... just thought I'd send you a message to let you know how things are going. I am still using PHONICS STEPS to teach English as a Second Language and it really works well. I am currently teaching a class of five women and one male student. When we began the class none of the students spoke any English and after a month they were all able to give a verbal presentation to explain their reasons for learning English. They also wrote the content of their presentation on my White Board and were very happy and impressed and so was I as well. PHONICS STEPS is an excellent medium for giving them a solid foundation. Thank you very much for your progrsm. You changed the lives of my stepdaughter and me, and now I want to change the lives of others through this program, "pay it forward," so to speak. I would actually like to incorporate pieces of this with my younger stepdaughter, Carol, who has Downs Syndrome and is going into the fourth grade. I am noticing that she is making some basic mistakes when reading, especially with guessing or substitution of uncertain words, and I'm wondering if this is how her special ed teachers are teaching her how to read. Thanks again for everything. You rock! The student is my son. He is a moderate-level reader, but he doesn't have the basic skills to be a fluent reader. He has always been one of the last students to complete tests. His reading speed is slow and he often struggles with long words. After approximately 10.5 hours of instruction my son has made great progress since he began this program. He increased over four grade levels on the San Diego Oral Reading Exam.... I didn't realize he could learn so much in such a little time. Edu-Steps is a step in a direction of obliterating illiteracy and equipping our kids with the reading skills they need to be successful in life. The program offers sequential learning of phonemes and phonetic skills. It is a no-fluff program that address the needs of children and adults alike in a fast and effective manner. It is not an entrepreneurs' "market to target". It's not a marketing strategy. It has been based on the 30-year NICHD research and birthed by teachers in the trenches in an attempt to solve a reading crisis in their own classrooms. I think it is an excellent research-based program. Others in Arizona are benefiting from this wonderful phonics program. It should be nationwide. Pat Doran and Theresa Manriquez, the creators of this program, have found that these are skills that are needed by students of all ages across the country. I am impressed with I have seen. Others may have questions about why both our high school dropout and our prison incarceration rates are increasing. Pat and Theresa have a clear understanding that these rates correlate with low reading and therefore, low academic scores: "Self-esteem begins with the ability to read efficiently and fluently. Teach others how to read and their future will have no limits!" I heartily agree. I know I was so amazed with my student's progress! I also started trying to use the program with my class about the last month of school. We only got to about page 30. Most of my class was receiving tutoring, but most of my kids from Dec-May made at least 2 years gain. Besides PSRS, I don't feel that I did anything significant to have that much gain. Between the 2 results (Her special ed 7th-grade student gaining 2 years in 20 hours of instruction. His instructional reading level that indicates how well he can read if in a class or with a support from a teacher went from 2nd grade to 6th grade level. )I am a firm believer! Thank you! Thank you! Thank you! I am the principal of an alternative charter high school in Cave Creek, AZ and I just wanted to let you know that how excited I am about the new reading program that our superintendent just purchased for all of our schools. The Phonics Steps program is a fantastic reading-skills program that I have introduced this year in all of my English classes. We have only been using this program for four weeks, but we are already seeing differences in our students' reading abilities in all of our classes. One of our most noticeable changes has been with one of our ninth grade special ed students. The student's IEP(Individual Education Plan) states that there should be no oral reading done in any classroom because the student has difficulty reading in a public forum. The mother of this student quickly brought this to our attention because her English teacher requires each student to give an oral presentation for a grade. Two weeks after we started the Phonics Steps program this student went to her English teacher after class and asked if she could read to the class the next day the short story that she had written. Her teacher reminded her that she did not have to give oral presentations but she said she thought the class would enjoy her story and she wanted to read it aloud. Her classmates loved her story and actually applauded her when she was done. Since that time our special ed student has actively participated, not only in her English class, but all of her classes. Her mother also noted the dramatic change for the better in her daughter's self esteem and attitude at home. As an administrator, I am always looking for programs that can help my students achieve their potential. The Phonics Steps program is the best reading program I have seen for high school students. A teacher can quickly move through the program and see results in a short period. Most importantly, the students can see they are improving their reading abilities and that helps them feel better about themselves. They are asking for more reading during their classes. At first, we bought a few for a few teachers to share and one for the office for others to check out. The extra one was checked out the first week and has been in use ever since. The special education teachers bought programs for themselves out of their own department budget because they were so impressed. This program provides what the older students have been missing. 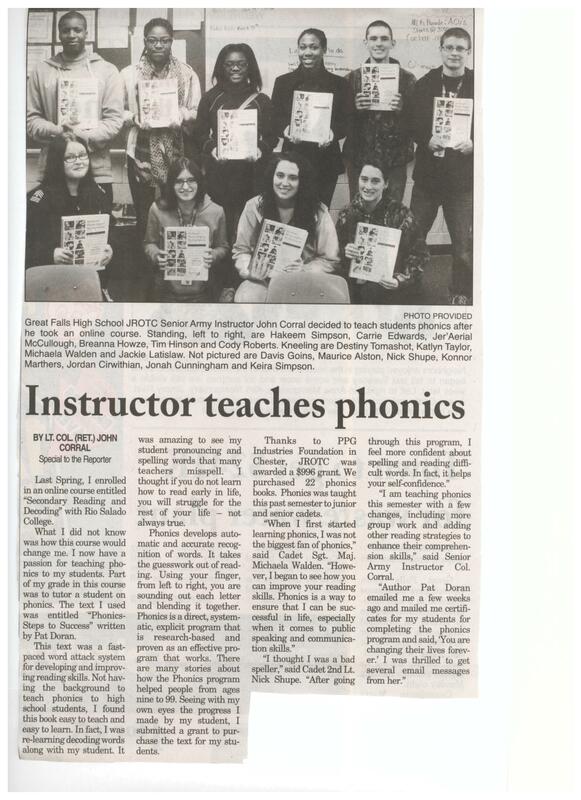 PHONICS STEPS meets the needs of those teachers who work with older students. It fills a necessary need. K-3 have their phonics programs but the older students miss out. This is exactly what we needed for our 4th-8th grades. The office staff and I noticed the behavior referrals were reduced 60-70 percent since the implementation of PSRS. I see the reading techniques being applied across the curriculum and the students are encouraging each other and are supportive when a classmate comes to a difficult word in subjects other than just reading. Teachers and students have the tools to "sound out" difficult words across the curriculum. The instructors in my reading department are excited about this program. We would like to order more copies. Thank you for developing such a fine program. Your program is perfect for high school special education students. Your program is the only one I found that is age appropriate for high school students as well as adults. My student have grown tremendously. They no longer guess; they attack the words and sound them out. Some of my students have jumped in their decoding abilities by several years. Their spelling is significantly better as a result as well. Our teachers love this phonics program. Even our primary teachers have adopted it as a supplement to another primary phonics program because Phonics Steps has so many more practice words than other programs. It also takes no extra work to use a lesson. The teachers use the other program for extra work and independent practice seatwork that the primary students need. This is an outstanding program. Although it is not promoted as a primary program, surprisingly, it has benefited our kindergarten through second grade level. Our kindergartners flew through it last year and are excellent first grade readers. It is incredible! That has never happened before in our school. The beautiful part of this is that on our 4th, 5th, 6th grade level had about a 20%-25% improvement and are now in the 70th percentile, up from the 50th percentile last year before we used Phonics Steps to Reading Success. On a personal note, this program helped my 5th grade son. We thought that we were going to have to retain him in 5th grade because of his grades. He is now a popular, academically successful student. Phonics Steps made a great change in his life and in mine as his parent. He didn't have a learning problem. He just had a decoding problem. This is probably the best thing to teach decoding skills in the way it is organized. It is not confusing. This program makes perfect sense. After the ten tutoring sessions of 30 minutes each, totaling only 5 hours, I re-administered the Miller Word Inventory Assessment [download able from www.donpotter.net ] and DIBELS Oral Reading Fluency assessments. I was a little worried that [my 2nd grade student] wouldn't show much improvement in either assessment because we didn't make it through the entire PSRS program, but I was mistaken. When I re-evaluated [my student] using the MWIA, she had a holistic score of 45 words per minute with 2 errors [from pretest of 22 wpm with 5 errors], and a phonetic score of 41 words per minute with 8 errors [up from 14 wpm with 27 errors]! The improvements were so dramatic; I scored them and showed her the results right away. She was so excited! We got a piece of lined paper and made a line graph (that was what I was teaching in math that weeks can't pass up the opportunity to connect learning!) that showed where she started and where she was now. I told her that when we finish the PSRS, we'll do the assessment one more time and we'll graph those results as well. Then, I completed the ORF assessment in DIBELS. On this evaluation, she also improved, going from a 17 in Oral Reading Fluency to a 35.